I know I am really late on this train, but at first I thought this product was a regular scam from Chanel, because if you still haven't noticed most makeup companies such as Chanel and MAC make most of their earnings on limited edition products. The companies know that those magic words ''limited-edition'' make all the beauty junkies run for their life ! Obviously, as soon as we hear limited-edition, we fall in the trap and we NEED to get it and now ! I saw this blush a couple of months back, around February at my dear Chanel counter at Ogilvy, the makeup artist made me try it, and I wasn't crazy about it, because at that time I still was not utterly obsessed with blushes, to me it was an unnecessary product. Little did I know, that a couple of months later, I would fall in the trap and actually WANT and NEED the blush, but ha ha ha let's not forget the ''limited-edition'' factor. So I search and search the Internet and find it obviously on eBay but at a ridiculous deranged price, so I drop my search and try to move on. A couple of weeks ago, I travelled to Aruba and found myself in the Duty Free makeup section at the airport and what do I see.................................THE BLUSH. I cannot believe it, after phone calls to all the Chanel counters in the city and even some in New York City because I was gonna travel there, it was right in front of me, the infamous ''limited-edition'' blush, that slipped through my fingers a couple of months ago. 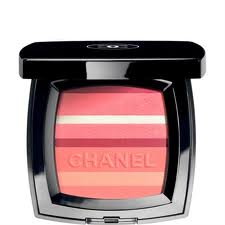 So here here to this fabulous blush : CHANEL Horizon de Chanel. I feel I had to share this experience, because I am pretty sure, all of you have already been in this type of pickle. Us girls, when we want something, we will get our hands on it !! Even if it is ''limited-edition'' !